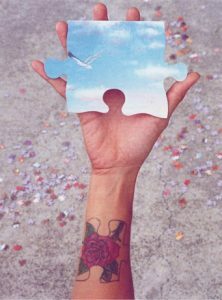 Plato Puzzles, is a company that 100% specialises in jigsaw puzzles. Both cardboard and wooden puzzles. From 6 to 1000 pieces, we have a challenge for every stage of life, and for every level of challenge. 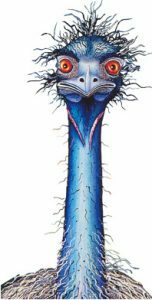 But always, we specialise in the production of unique and thought provoking Australian artworks. 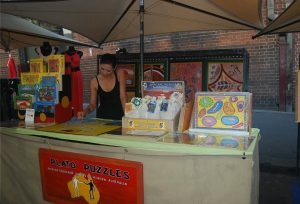 Based in Narraweena on the northern beaches of Sydney, Plato Puzzles has been making jigsaw puzzles for over 18 years. 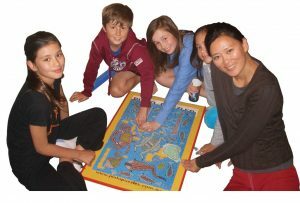 All our wooden puzzles are 100% made by us here in our Narraweena workshop. 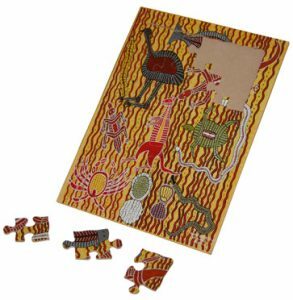 We use all Australian products, and our puzzles are saw cut 3mm MDF timber tray puzzles. 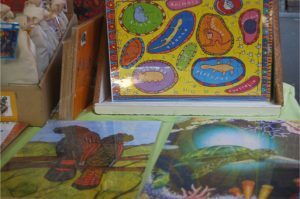 We have an enormous range of artworks and available sizes. There are over 40 different images and over 150 different cuts and sizes available. 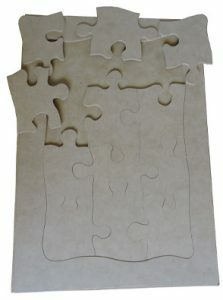 We also produce custom puzzles for schools, child care centres, conferences and special occasions. 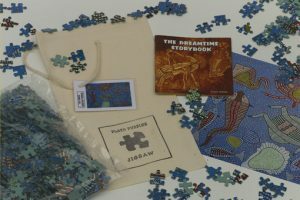 All our jigsaws come with rear “information sheets” on the under side of the puzzle tray, that provides a full background to the artist, the work, and the culture that underpins it. All our wooden puzzles come as either frame tray(jigsaw with a base) or as a floor puzzle(jigsaw only, no base). Custom puzzles can be made to order, but our listed puzzles will all be frame tray puzzles with the exception of the “Giant Floor Puzzles”. These puzzles are too large for a tray. But with a tray a puzzle is safer, its pieces are more secure and its stores away easily. 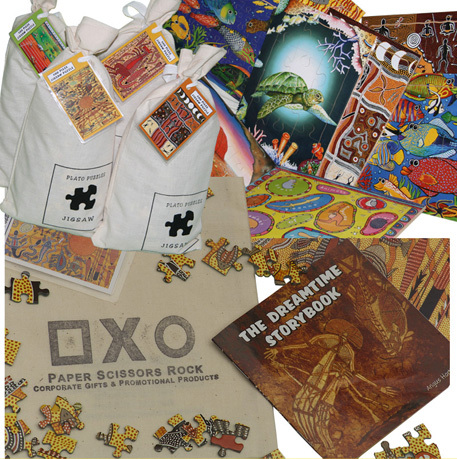 The Plato Floor Puzzles all come in a pull-tie calico bag, with a map and puzzle information enclosed within. Catalogue sizes from 6 to 96 pieces. Timber choices. Plywood, raw timbers. Timber thickness also optional. Costs vary per individual specifications. Printing – Offset, digital, ink-jet. Different visual effects via paper choice. Rear information sheets. Glued to the base of the tray, this area can be filled with the messages and themes of the jigsaw artwork. The process can be managed by Plato Puzzles from A to Z. Alternatively costs can be reduced by customers taking responsibility for parts of the process. For instance, custom puzzles require a scan of the artwork, to take the image from the paper to the digital realm. This is but one example of a task that can be performed by Plato Puzzles or the client. Blank puzzles for hand painting. 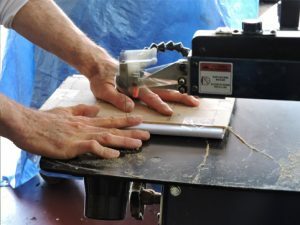 Plato Puzzles can supply plain timber sheets, both pre saw cut, and uncut timber, for painting directly onto the jigsaw surface. Custom Display cases. 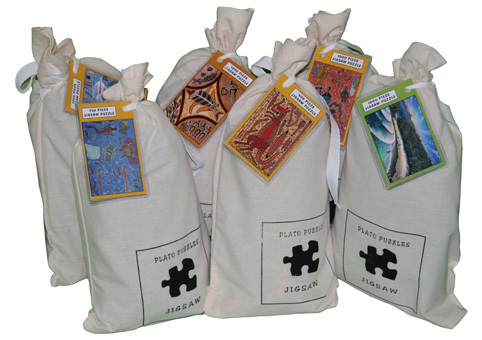 Plato Puzzles can present the puzzle in high-quality storage cases. We provide a range of options or you are free to specify your own needs. Prices will vary according to timber type and additionals, such as a sliding perspex cover. 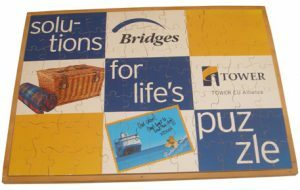 Our range of cardboard puzzles range from 100 to 1000 pieces currently. We chop and change our range over time, so the choices will vary over time. But we always maintain the highest of standards in our artworks for all “difficulty” levels. Whilst we provide the odd truly “difficult” challenge, our jigsaws are primarily about the art. Creativity, vibrancy and a deeper story are the core themes. We generally avoid challenges that do not take into account modern lifestyles – time is a precious commodity, and people gather motivation and momentum in puzzle challenges when they make progress. So whilst never “patronising” the puzzler, we keep the challenge at a level that is clearly stipulated, and only in rare cases will prove to be a mind bender!! 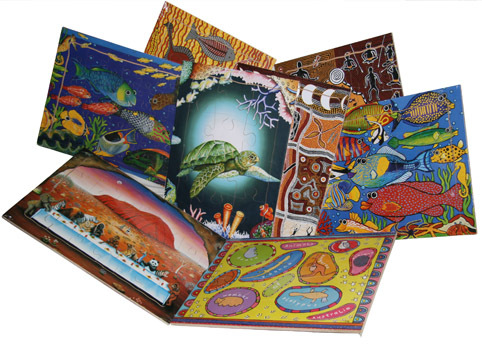 a storybook to provide the background to the painting, the artist and the culture themes underpinning the work.